Typhoon “Marilyn” with international name “In-fa” has already entered the Philippine Area of Responsibility or PAR and was located at 1,165 km East of Baler, Aurora (15.4°N, 132.4°E) with maximum sustained winds of 160 kph near the center and gustiness of up to 195 kph. It is forecast to move West Northwest at 20 kph. Inter tropical Convergence Zone (ITCZ) affecting Mindanao. The typhoon will not directly affect the country and is not expected to make a landfall base on the track forecast by several weather agency. The typhoon will curve its path by Tuesday as it heads toward the sea of Japan. The Typhoon is expected to exit the PAR section by Friday. The country will experience cloudy skies and moderate rains due to the weather conditions caused by Typhoon Marilyn. 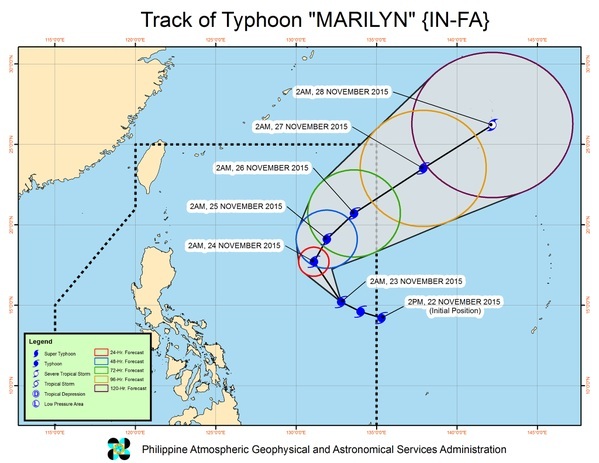 No Comment to " Typhoon Marilyn Has Already Entered The PAR Area,Expected To Bring Light To Moderate Rains "